A Growing Mountain of Toys! The Bakersfield P.S. community has proved to be very generous this holidays season! In barely over a week, a small pile of toys in the office has grown into a full fledged toy mountain –and it keeps getting bigger every day. 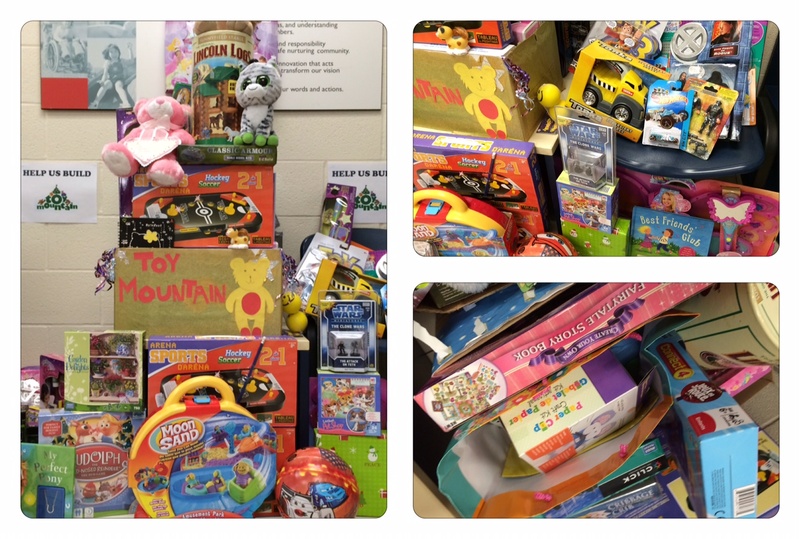 We will continue to collect toys through Thursday December 12, 2013 to support Toy Mountain, a program in conjunction with CTV and the Salvation Army, which distributes gifts to children in need over the holiday season. If you’d still like to, please have your child drop off an unwrapped toy in the office. Remember that families are also invited on Thursday, December 12, 2013 at 5:00 p.m. to the North Thornhill Community Centre, where our Toy Mountain will be donated, and where CTV Weather Anchor Tom Brown will broadcast the event live during CTV Toronto’s News at 6!